© Copyright Two Hills Ltd www.twohills.co.nz. This image is licensed under a Creative Commons Attribution-ShareAlike 3.0 Unported License. Please attribute to "© Copyright Two Hills Ltd www.twohills.co.nz" plus the URL of the source material. and click here for an extract (PDF) from an early revision of the S+C book, talking about how S+C relates to Cynefin. 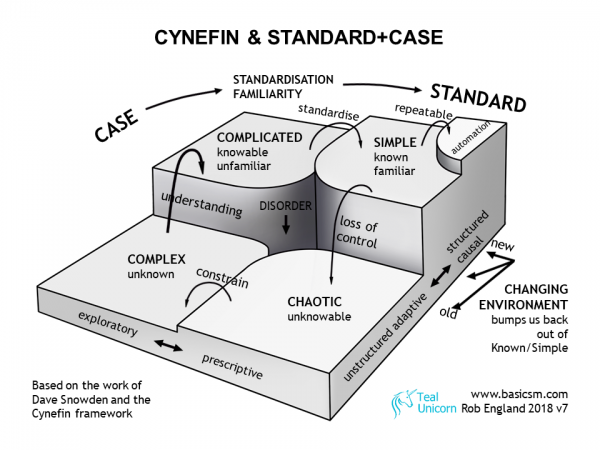 based on the work of Dave Snowden and the Cynefin framework. ●	complicated: knowable, but requires expertise to respond. ●	complex: unknown, requiring the development of new knowledge and expertise to respond. ●	chaotic: unknowable, beyond our ability to learn. ●	disordered: we think we are in one state when in fact we are in another, we don't know what we are doing. Standard+Case is our own contribution to the field, conceived by Rob in 2010. It can be thought of as a simpler model than Cynefin. 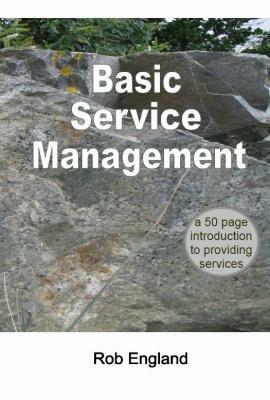 Standard+Case is a method for categorising and resolving any sort of transactional work. You can only industrialise that which you can standardise, i.e. make known: described, predictable, and repeatable. Only some of the world can be standardised. Some situations will always be unfamiliar due to change, or unpredictable due to complexity. Standard+Case is a synthesis of our conventional "standard" process-centric approaches to responding, with Case Management, a discipline well-known in industry sectors such as health, social work, law, and policing. Note the tiny “automation” slice in the top right corner of the above diagram. We can (currently) only automate that which is defined and repeatable. We must standardise to automate. Automation only removes toil and drudgery, not other work. Also note the step down from chaotic to complex, which many people find counter-intuitive. The vertical axis is “negentropy”: energy, order. It takes energy to make a system chaotic, it settles into complex. Dave Snowden himself made this improvement to the picture. He approved of this 3D view of Cynefin.